All transactions are safe and secure with a reliable history in online purchasing behind each of our associates. Buy the House Cast t-shirt to own House clothing and merchandise. "Normal's not normal, if you're not normal." This and other Gregory House M.D. quotes come to mind when recalling his interactions with the cast on these House t-shirts. The idea of what is "normal" is raised quite often on the show. Dr. Allison Cameron tells House, "It's normal to want to be normal." The characters often express their views on normalcy, because patients with symptoms and illnesses that aren't normal surround them. 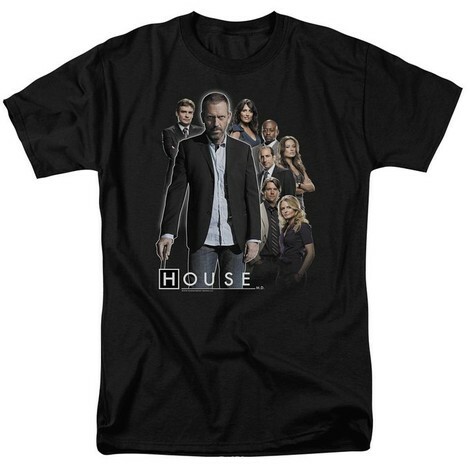 In addition to the House Cast tee above, browse the House Clothing Gallery for more apparel like men's and women's clothes, kids shirts or hoodies.